Q, believe that the pistol which he was about to clean was loaded, pointed it at his friend R. R laughed and pretended to be shot. However, the gun went off and, in fact, R was killed. Unknown to Q, Q's on had loaded some bullets into the pistol. Question Q, believe that the pistol which he was about to clean was loaded, pointed it at his friend R. R laughed and pretended to be shot. However, the gun went off and, in fact, R was killed. Unknown to Q, Q's on had loaded some bullets into the pistol. Advised Q. 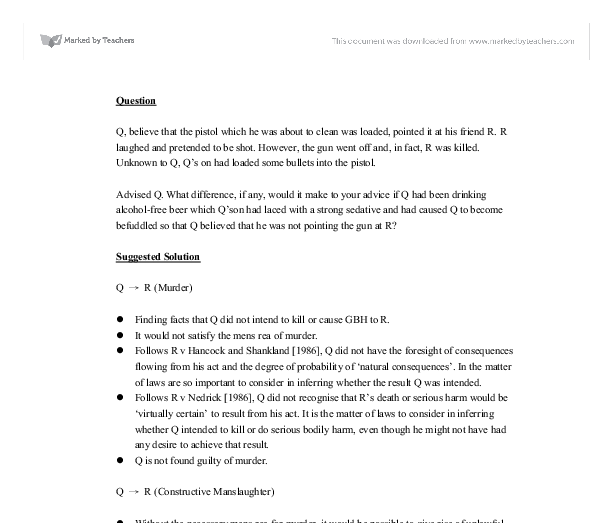 What difference, if any, would it make to your advice if Q had been drinking alcohol-free beer which Q'son had laced with a strong sedative and had caused Q to become befuddled so that Q believed that he was not pointing the gun at R? Suggested Solution Q � R (Murder) * Finding facts that Q did not intend to kill or cause GBH to R. * It would not satisfy the mens rea of murder. * Follows R v Hancock and Shankland , Q did not have the foresight of consequences flowing from his act and the degree of probability of 'natural consequences'. In the matter of laws are so important to consider in inferring whether the result Q was intended. * Follows R v Nedrick , Q did not recognise that R's death or serious harm would be 'virtually certain' to result from his act. ...read more. * Finding facts supported that Q was aware of the risk and went ahead regardless or had not given the matter any thought. (Caldwell objective reckless) * Alternatively, if Q had considered whether there was a risk that the gun would gone off, but had wrongly concluded that it was safe, the position is less certain. * In this scenario, there may be a case where Q considered whether there was a risk of harm and decided that there was none (wrongly concluded to be safe). * Q was not reckless within the precise wording of Lord Diplock's definition in Caldwell because he had given considerable thought to the risk but come to the wrong conclusion as to its significance. * In this situation is sometimes referred to as the "lacuna" or "loophole" in the Caldwell principle, this matter was consider by House of Lord in R v Reid . * There are two situations that can be drawn, either Q was aware that there was a risk, but went ahead regardless (concluded no risk) or that Q had not given the matter any thought, as he did consider, whether there was a risk, but came to the wrong conclusion. ...read more. * Consequently, Q may argue his state of intoxication that he would not have pointed the gun at R and pulled the trigger had he not been drugged. * Alternatively, Q may argue that the sedative drug administered to him by his son caused him enter into a state of automatism in which he was not in control of his acts followed the case R v Bailey . (mens rea was not formed) * "Automatism" applies to the situation where the defendant is not legally insane but because of some external factor he is unable to control what he is doing. * In contrary, follows the principal authority of the Court of Appeal decision in Bailey , an accused may be prevented from raising the defence of automatism, where there is evidence to show that he was in some way at fault in bringing about the state of automatism. * On the other, the court requires to investigate whether Q was reckless in consuming the drug that caused him to enter into the state of automatism. * Given facts supported that Q 's son has given him the drug without his knowledge, so that he would not therefore be reckless and should be allowed the defence of automatism. ...read more. 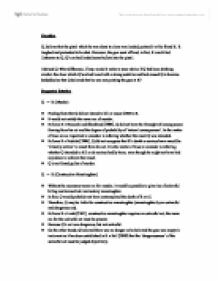 Critically evaluate the principles governing the law on Intoxication. His defence of intoxication was rejected and he was convicted of manslaughter as no specific intent is required for manslaughter and self induced intoxication is not considered a defence. In circumstances where the defendant did have the required mens rea of the offence despite being drunk, he is then guilty of the offence. Euthanasia is illegal in the UK however it is not illegal for doctors to issue drugs for pain relief that may accelerate death. This was decided in the case of Dr Adams where Lord Devlin said that if the primary effect of the drugs/injection is pain relief then death will effectively be a secondary effect of the treatment. not coincide at the inception of the chain of causation but do at some point in the chain and thus a conviction can be successful. The principles of both coincidence and causation have developed considerably over the last century as has been shown in the discussed case law. (II) D recognised that the actus reus was a virtually certain consequence of his actions, though he does not act in order to bring about the intended outcome. He acts for other reasons, but knows that the actus reus is an 'inescapable concomitant'. This may also be seen as unfair, as D may not have any intention to do any wrong, and may not realise that his act does in fact entail any danger. The risk need only be of "some harm" as shown in the case of Larkin where the defendant was threatening somebody with a razor. The mental element of the crime of theft is, dishonesty with the intention to permanently deprive. There are exceptions of the theft act, s.2 (1), which are belief that in law they have a right to it, belief consent would be given or belief that the person whom it belongs to cannot be found.